a couple of eggs scrambled with feta, 1/2 a Bay’s English Muffin, which I bought at Murray’s http://www.bays.com/muffins/ – BEST English Muffin I’ve ever had… oh – and a little dab of butter with sea salt (also bought at Murray’s – they call it ‘crack butter’ there), which melted divinely on the muffin. I’m trying to eat more fruits and veggies these days, so I also had a little ramekin on the side with some blackberries and a couple sliced strawberries along with a small glass of Wholefoods 365 brand freshly squeezed tangerine juice. YUM. Then I went to a beginner’s meditation class at the Interdependence Project http://www.theidproject.org/. It was my first time actually going to a teacher to try meditation. It was challenging – my contacts felt dry, my feet felt like they were going to fall asleep, my back hurt and I almost dozed off. Oh – and a million little thoughts kept popping into my head. But the teacher explained how that’s what always happens. She gave me a great analogy – that your mind produces thoughts like your stomach produces acid – it’s just what it does. So the key is recognizing when your mind has wandered and then bringing it back in to focus each time. She also gave me a more comfortable position to sit in, which really helped in the next 10 minute session. I thought she was really nice and I enjoyed the class. I’m going to try it on my own tomorrow morning. After the meditation I got together with my friend Pam. As we were walking, she pointed out these engraved stones on the brick building we were passing. I like this one below – because it made me think of 1983. I was 4 years old in nursery school. At that age, I probably only loved my parents, my sister, my dogs and my grandparents… oh, and maybe a Cabbage Patch Kid or 2 (yes, the Cabbage Patch phenomenon started in 1983). I think by the end there were 11 in my family. We were privileged children. 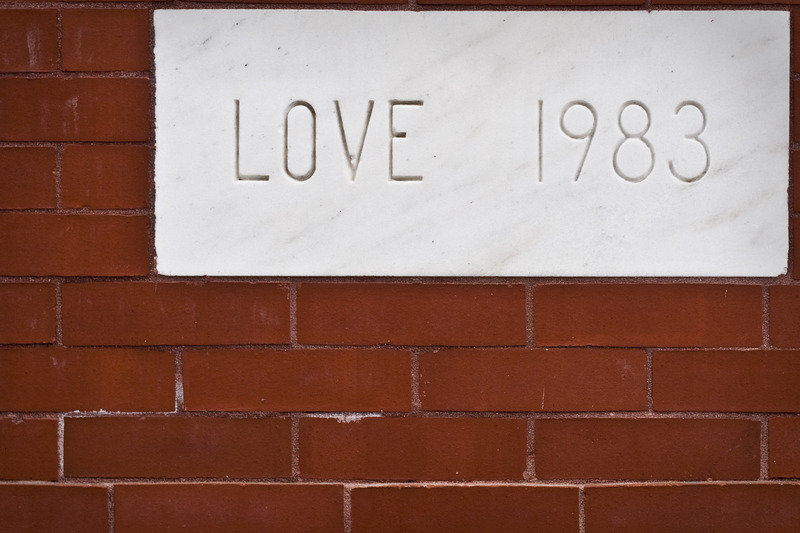 Who did you love in 1983?